Home/ About Us/ Subsidaries/Sichuan Ya Dong Cement Co., Ltd.
Sichuan Ya Dong Cement Co., Ltd.
Sichuan Ya Dong Cement Co., Ltd. (the “Company”) was a Taiwan-based enterprise established in 2004 by Asia Cement Corporation and Ya Dong Holding Co., Ltd., both of which are subsidiaries of Far Eastern Group in Taiwan, with a total investment amount of approximately RMB4 billion. Construction was carried out in three phases, where one new dry process cement production line with a daily clinker capacity of 5,000 tonnes was built in each phase. Phases one, two and three were put into operation on 28 September 2006, 28 December 2008, and 14 March 2010 respectively. 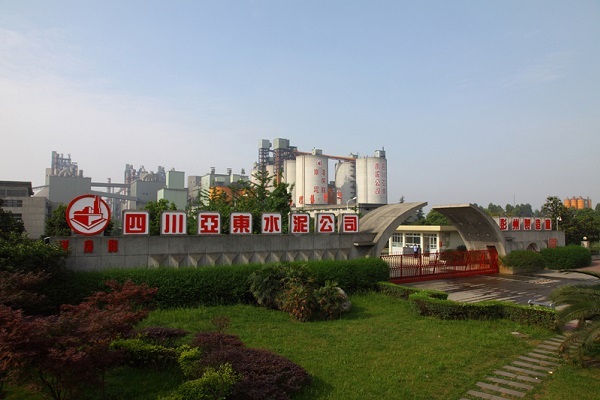 The Company’s existing annual cement capacity is 6 million tonnes, which not only provides quality cement products to Greater Chengdu region, but also contributes a considerable amount of tax revenue to local government, provides a number of job opportunities, and creates opportunities for the Company’s development and expansion. The Company had originally planned to transportation limestone from the quarry to the factory by railway (total distance: 29 km). However, due to the construction of Guankou dam, approximately 8 km of of the originally planned railway tracks would be flooded. As a result, from the quarry to Guankou, limestone will be transported by a conveyor belt (total distance: 12.613 km), and from Guankou to the factory, limestone concurrently is transported by car. Beumer Group, a German company, was responsible for the design, installation and fine-tuning of the project. Up to 2,200 tonnes of limestone can be transported per hour. As most sections of the conveyor belt run on treacherous terrain, through mountains and river valleys, it made design and construction extremely difficult. The construction period lasted for two years, with a total investment of approximately RMB300 million. The conveyor belt is currently in operation after trial run was successfully completed on 8 March 2009. The Company is planning for phase two construction of a new conveyor belt, replacing road transport from Qianjin Loading Terminal in Danjingshan Town Gate to Pengzhou factory in Tianpeng Town with a conveyor belt system, in order to reduce the impact of road transport on highway, and to be more environmental-friendly. This project starts from Qianjin Loading Terminal in Danjingshan Town, runs alongside the special railway line for transporting ethylene petrochemical (distance in between: 22.5 m), through Danjingshan Town, Longfeng Town, Lichun Town, and stops at the limestone warehouse on the southwestern side of the Company’s factory in Tianpeng Town. The total length of the conveyor belt is approximately 13.6 km, and designed transportation capacity is 2,200 tonnes/hour, with an investment amount of RMB394.5 million. Preparation for the approval and environmental assessment of the project is now in progress. The project is expected to complete and begin operation by the end of 2015.